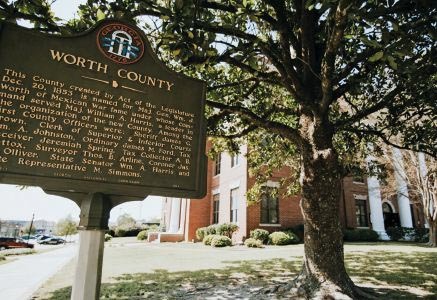 Worth County Georgia - Why Worth County? Land – The Worth County Economic Development Authority (EDA) has in excess of 240 acres of raw land in two different industrial parks ready for development. 196 Acres resides in our GRAD Ready Industrial Complex. Land parcels are available for lease or for sale. In some cases, the EDA will be in a position to discount land prices or, in some cases, donate land for development. Acreage depends on the prospect’s needs. Conveniently located on U.S. Hwy 82 in Sylvester, we are just 180 miles south of Atlanta, 20 miles west of Interstate 75, and 95 miles north of Interstate 10 on Florida. 100% Freeport Exemption – Worth County is currently 100% Freeport exempt in all classes. Sylvester Airport - Just 3 miles out of town, The Sylvester Airport has a 4525ft asphalt runway. Property Tax Discounts and Abatements – The Worth County EDA may offer property tax discounts or abatements. Such discounts or abatements can be accomplished with a lease agreement or land donation and ownership of the property must remain with the EDA. Bond Financing – The Worth County EDA has legal power to issue tax-exempt bonds for the financing of capital improvements such as land, buildings, and equipment. This would reduce the cost of financing for the prospect and abate property taxes since the EDA would retain ownership of the property. This is contingent upon the credit worthiness of the prospect. BEST – Georgia’s Job Tax Credit – Businesses creating ten(10) or more jobs in Worth County may be eligible for a job creation state tax credit of $2,500 per employee. The credit begins in the second year and continues for five years. The total tax cannot exceed 50% of a manufacturer’s state corporate tax liability; however, any unused tax credit can be carried forward for ten years. Furthermore, unused tax credits can be used to offset wage withholdings. Please note that these must be new, full-time jobs to the State of Georgia and health insurance benefits must be offered to the full time employee (but not necessarily paid for by the employer). Quick Start – A Georgia program to aid new industries and train their employees is administered by the Worth County satellite office of Moultrie Technical College. Under this program, the State of Georgia pays for screening, hiring, and training of workers. Fire Protection – The Enhanced 911 system provides Worth County with easy access to fire protection. The City of Sylvester’s ISO rating is 3. Worth County has fire protection as well, including volunteers, with an ISO rating of 9. Electrical Power – MEAG power provides Sylvester with electricity and it is distributed by The City of Sylvester. Georgia Power Company and Mitchell EMC distribute electrical power in Worth County. Specific application of rates and services can be negotiated by contacting the City if Sylvester, Georgia Power, or Mitchell EMC’s local managers. Water Capacity – The City of Sylvester’s excess water capacity is 2,700,000 gallons per day average. Total capacity is 3.5 million gallons per day and water usage averages 800,000 gallons per day. Mains of 10” to 12” serve most of the industrial area. Rates are negotiable. Natural Gas - The City of Sylvester distributes natural gas to the industrial community with a 2” gas line. The City’s system is fed by the South Georgia Natural Gas Company. Sewer System - The City of Sylvester operates a new wastewater mechanical treatment facility. This new facility serves both residential and industrial customers. It is permitted for 1,160,000 gallons per day, giving Sylvester an excess sewage capacity of 400,000 gallons per day. Sewer rates are negotiable as well. Availability of Grant Programs – The State of Georgia offers many grant and assistance programs geared directly towards job creation such as EIP, EDA, Revolving Loan Funds, and OneGeorgia. For start-up companies, expansions, and projects that involve job creation, funds may be applied for through the Worth County EDA. Such funds may be used for capital improvements such as land, buildings, equipment, and infrastructure needs. Availability of Chamber and Development Authority Offices – The Worth County EDA offices at 122 N. Main Street in Sylvester are available for job interviews, calls, or any business related activity of a prospect or existing industry or business. The office space will be provided free of charge. Fiber – Fiber is available upon request. The Worth County Development Authority structures incentive packages customized to the requirements of industrial prospects. Incentives are based on the overall investment in land, building, and equipment and on infrastructure demands as well as the number of jobs created and the value of those jobs as they relate to the average payroll in Worth County.